The Gerard L. Gormley Justice Facility opened in 1985 and was built to house 398 inmates. Since that time, the facility has undergone substantial growth and expansion and now houses an average 1000 inmates with custody jurisdiction over an additional 250 inmates who are sentenced to various community programs. A nationally recognized leader in county correctional facilities, the Atlantic County Department of Public Safety is charged with the operation of the Justice Facility. The New Jersey Administrative Office of the Courts has recognized the Justice Facility's inmate classification program by incorporating it into their statewide computer system for use by all associated counties in New Jersey. In October, 1997, the Justice Facility opened its own Correction Officers Academy, certified by the New Jersey Police Training Commission, and graduating its first class in January 1998. The Academy training at the Canale Training Center trains all Atlantic County Correction Officers and will accept trainees from other New Jersey Counties. 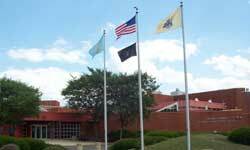 The Justice Facility is located at 5060 Atlantic Ave., Mays Landing, New Jersey. It is an Adult Detention Facility housing male and female inmates who are pretrial, county sentenced and in certain instances, state sentenced awaiting shipment or state inmates contracted to the Facility. The Facility has two main sections, the Main Jail Building and the Main Jail Annex. Consistent with the law, the Atlantic County Justice Facility maintains a zero-tolerance policy regarding sexual abuse, sexual harassment and excessive force against inmates. Zero tolerance for the purpose of sexual abuse and sexual harassment committed by an inmate or staff member means that it is strictly prohibited, thoroughly investigated, subject to disciplinary action, and will not be tolerated. All third party reports will be investigated. When the Atlantic County Justice Facility and/or Atlantic County Prosecutor’s Office conducts its investigations into allegations of sexual abuse it shall do so promptly, thoroughly and objectively for all allegations including third-party and anonymous reports. If you believe an inmate has been subject to any of these acts while in this agency's custody, contact the Atlantic County Justice Facility’s Internal Affairs Investigation Unit at (609) 909-7434 or the Atlantic County Prosecutors Office 609-909-7800.